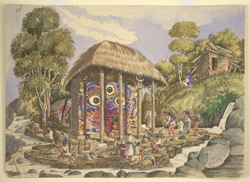 Watercolour of a shrine with a painted head of Bhairab at Pharping in Nepal, by Henry Ambrose Oldfield (1822-1871), dated July 1857. The image is inscribed on the reverse: 'Head of 'Teekha Bheirab' near Pherphing. July 1857'. Dr Oldfield was Residency Surgeon at Kathmandu from 1850-1863. After his death his family published his two volume 'Sketches from Nipal, Historical and Descriptive...' (1880), which described life in the court of the Maharajah Jung Bahadur and also contained descriptions of Buddhist architecture, together with illustrations from Oldfield's own drawings. This drawing shows Bhairab, a manifistation of Shiva in his fearful form. Bhairab is often represented with his consort Bhairavi, and are worshipped by Buddhists as well as by Hindus. Bhairab's iconography includes an open mouth, prominent fang-like teeth, dishevelled hair, a third eye in the middle of his forehead, and he is usually represented trampling upon a demon.